Joe and Kelly have closed over 200 transactions. 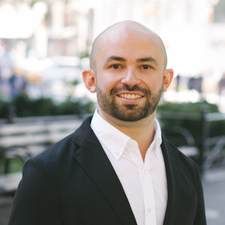 Joe's expertise has been featured in The Real Deal, Brick Undergound and in Thrillist using his expertise to help sellers in New York City. Native New Yorker Joe Quiros is a devoted real estate professional who firmly believes that helping people exceed their real estate goals can be done with integrity, honesty and good intentions. For Joe, guiding people through one of the most stressful and most important decisions they'll ever undertake is a privilege and an honor, deserving of his utmost attention and energy. Whether working with first-time buyers or seasoned developers and investors, Joe believes in delivering unfailing accessibility, trusted expertise and a true focus on nurturing a successful and long-lasting partnership with his clients. It's an attitude he forged in his former career in the recruiting industry. As he sums up, "At the end of the day, no matter what industry, little can be achieved without forging meaningful relationships." As Co-Founder of The Joe + Kelly Team at Compass, Joe and partner Kelly Waters focus on doing business "the right way," building stellar client loyalty and success in the process. A graduate of Boston College, Joe currently resides in the beautiful West Village. An avid sports fan, when he's not hard at work, you'll likely find him cheering on his beloved Yankees, Rangers and Giants.